Kolkata: The West Bengal government has stopped giving possession of plots in Rajarhat on the eastern fringes of Kolkata because it is unable to acquire land to build civic infrastructure such as roads and underground sewers. Due to unavoidable circumstances, “infrastructure development work has been retarded to a considerable extent", West Bengal Housing and Infrastructure Development Corp. Ltd (Hidco) said in a recent notice to people to whom plots have been allotted. Hidco, an arm of the state government, is building the 28 sq. km township expected to house some one million people. This could, however, take years because it will be extremely difficult for the government to forcibly acquire land, though 10 years ago, when it acquired around 3,000 ha for the township, it faced almost no resistance at all. Resistance to land acquisition in West Bengal gained momentum after the government seized 1,000 acres of farmland in Singur in Hooghly district for Tata Motors Ltd’s small-car factory. It intensified in 2007 when the government tried to acquire land for a chemical hub project in Nandigram in East Midnapore district. Both projects were shelved. In Nandigram, the government couldn’t even acquire land. This effectively means that the state government has indefinitely stayed the transfer of some 4,500 plots spread over about 22 sq. km. 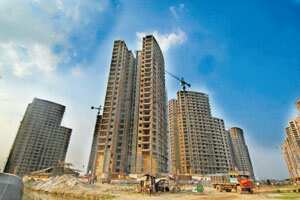 Rajarhat is divided into three action areas. Action area 1, which is the smallest, is ready, but civic infrastructure in action areas 2 and 3 is woefully deficient. Only 30% of the underground sewer system in these action areas has so far been built, according to Hidco, which has already allotted 8,500 plots in the 2,877 ha township. Subodh Bhattacharjee, Hidco’s director general for engineering, said land acquisition was the biggest problem slowing infrastructure development in Rajarhat. “Even taking possession of land that has already been acquired is becoming difficult because of political resistance," he said. “Locals are demanding for jobs and asking the state government to raise the compensation (which has already been paid)." Political resistance to land acquisition is being led by the Trinamool Congress, West Bengal’s main opposition party. At the height of controversy over land acquisition in Singur and Nandigram, the Trinamool Congress staged a major comeback in the 2008 local body elections and since then, in partnership with the Congress party, has consistently outperformed the Communist Party of India (Marxist)-led alliance of Left parties that have ruled West Bengal since 1977. Hidco needs to build at least 18.5km of roads to connect the interiors of the township with its main arterial road, and because the underground sewer system has not been built, storm water seepage is damaging even the 10.5km main arterial road. Hidco has already spent some Rs125 crore on repairing it, according to Bhattacharjee. He declined to comment on the amount of land Hidco needs to acquire to build civic infrastructure in action areas 2 and 3, but another Hidco official said on condition of anonymity that it was less than 1,000 acres. “We don’t need large tracts of land. For instance, we need only 12 cottahs (one-fifth of an acre) to erect electricity towers in a certain area, but because of resistance to land acquisition, we are unable provide power connection in that area," the official added. Hidco’s decision to stop handing plots in Rajarhat’s action areas 2 and 3 is going to affect hundreds of thousands of private homeowners. “Though people who are constructing commercial complexes and condominiums are trying to build the civic infrastructure on their own, it is impossible for private homeowners to do that," Bhattacharjee said. “Giving possession of plots to these people would have led to a lot of embarrassment for us." But even developers of commercial complexes and condominiums have been affected by the lack civic infrastructure in Rajarhat. Most projects are behind schedule and developers are paying penalty for late delivery of flats and commercial spaces. Hidco, too, will be paying penalty for late delivery of plots. “We are going to pay interest to people to whom plots have been allotted," chief financial officer P. Sen. “Hidco has made provision in its budget for payment of penalty but it is going to be a huge amount."